Oaxacan dancers and musicians celebrate with a colorful parade. Count yourself in the fun! Click here to view a slideshow of images from the making of Count Me In! Practice your numbers in English and Spanish when you count the beautiful dancers, playful musicians, and happy children of Oaxaca as the Guelaguetza parade goes by! Pronounced Gal-a-get-zah, the lively celebration—full of traditional dancing and music—takes place every July deep in the heart of southern Mexico. ONE band leader with a big white balloon! DOS hombres with firecrackers! THREE musicians! FOUR giants! 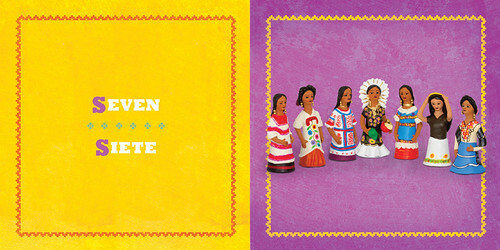 All exquisitely handcrafted by the Mexican folk art masters Guillermina, Josefina, Irene, and Concepción Aguilar, in collaboration with author and scholar Cynthia Weill. Bienvenidos! Welcome to the parade!